Fiesta is a very tasty mid season broccoli. Until last year I had never gotten a big head of broccoli. My heads were maybe 3-4" across if I was very lucky. Production never amounted to much. Last year I tried Fiesta. I was floored. The heads were huge. I figured a broccoli that has huge heads wouldn't continue to put out side shoots, but it does. And some of the side shoots are real broccoli heads in their own right. 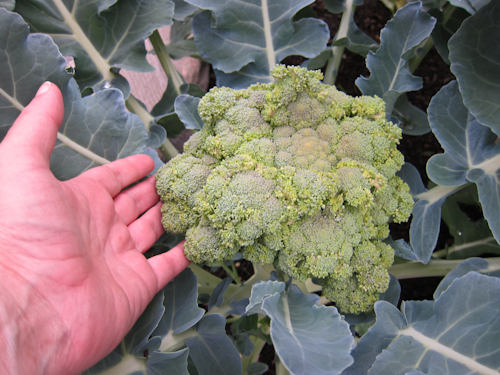 Before I grew this variety, broccoli was a much loved plant that couldn't pull its weight in the garden. I grew it anyway. But this one will produce all the way from summer into fall. Last year I harvested 22 pounds in two thirds of a 4'x8' bed. So it was giving me a pound per square foot. Amazing for broccoli. It does have its flaws. 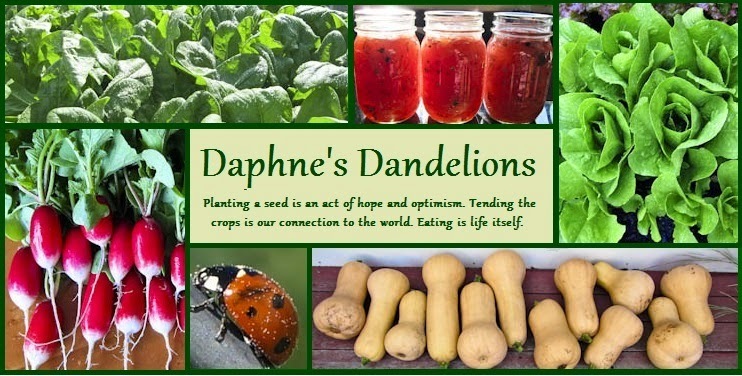 Minor ones for someone that isn't selling her produce. The heads don't stay flat. The head above still has very tightly packed buds. It hasn't greened up yet and is still quite yellow. But the head is already irregular. It has a very small picking window unless you want to pick it at this yellow green stage. 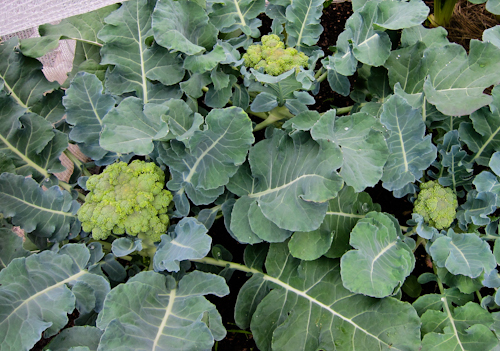 Once it gets to the typical broccoli color it is almost ready to burst into bloom. Sometimes there are also brown spots in the head. So far I haven't seen them yet this year, but later in the summer as it gets warmer, it will become more frequent. They are easy enough to cut out as a home grower, but they wouldn't make it if you wanted to sell them. Also the stems will get tougher and sometimes the thick stem will have a hollow core. Now I'm eating the stems with relish, but later on I'll have to peel them if I want to eat them. I'm fine with that. The production and the good taste are enough to overcome its minor flaws. The taste does change over the season if you keep the plants in production. The first pickings are pretty mellow, but as the heat comes on and the plant gets older, the flavor gets more intense. Usually I hate my broccoli with cheese sauce, because it covers up the taste of the broccoli. But when the flavor intensifies, cheese sauce starts to make a lot of sense. It can hold its own next to a sharp cheddar. I'm linking up with Liz over at the Suburban Tomato. Check out the other Saturday Spotlights. That sounds like a great broccoli. I don't mind the types of flaws that it has so long as it tastes good and is at least moderately productive. It would be interesting to see how it does in my moderate climate. It sounds like it would stand up to some of my favorite strong flavors - garlic and anchovy. Nice review! I'm still learning to branch out and try new varieties of, well, every vegetable. This looks like it could be a lot of fun to try to grow! Thanks for the info! One of the most enjoyable challenges of gardening is "shopping around" until you find varieties that work well in your conditions. I have never seen "Fiesta" before, presumably because it has the flaws that you describe. People only seem to want stuff that is perfect - dead regular (and often dull!). It's interesting that you say it starts off yellow and then turns green. It's usually the other way round with broccoli. Yellowness is often associated with being over-mature. I like the idea of this broccoli. I grow a lot of Calabrese but I am looking for a variety that produces at least one really big head to grow along side it. I usually grow Green Dragon but it has been really slow this year. I'm also interested that you grow it over summer. How do you keep the aphids in check? Just remember that your summers are not our summers. Boston only gets 13 days on average in the 90s (32C) each year. We are very cool. Most broccolis won't take even our heat all that well. Some do, some don't. This one is fine with it. When I see aphids on the plants I cut sections of the plant out totally. I need to cut the plants back occasionally anyway or they get too big. I can even cut the whole plant back practically to a stump and it will come back. Hi Sharon. No nightshades is so hard. I used to eat so many of them. I think they were in all my meals. And going out is problematic. I hope it works for you. Daphne, as you know this was my first year growing Fiesta broccoli and it was a definite success! I have grown Fiesta and I have it in my garden now, but it hasn't even begun producing heads yet. I think last year I didn't get any from the Fiesta til late in the summer. Likely due to not having a ton of sunlight here. Yours looks gorgeous and I hope mine even just approaches that! Wow. I think I need to give this one a go. It has a lot of great qualities despite the minor items you noted. I appreciate the review. 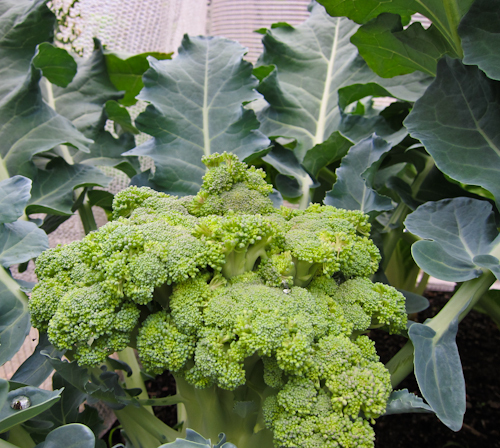 I love the look of your broccoli, I wonder of that variety would grow up my Cotswold hill? Very tempted to try it. 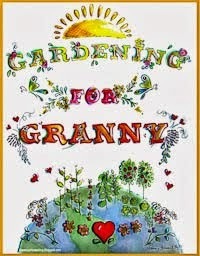 I've been gardening for almost three decades now, ever since my husband and I bought our first house. Every garden has been different. The first was small and the soil was almost pure sand. The second was larger and I had heavy clay. The third and current one which is just outside of Boston, is by far the largest even though the lot is by far the smallest. Since we bought the house new, we designed the landscaping ourselves, and the soil we added was fairly good. My challenge here is the location. We are so close to our neighbors that their houses can shade the garden. Creative Commons Attribution NonComercial 3.0 Unported License. Powered by Blogger.